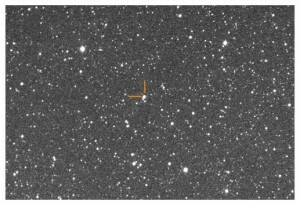 Confirmation of the Nova candidate ASASSN-17mt was achieved in the early hours of September 29 local time, a few days after the announcement. 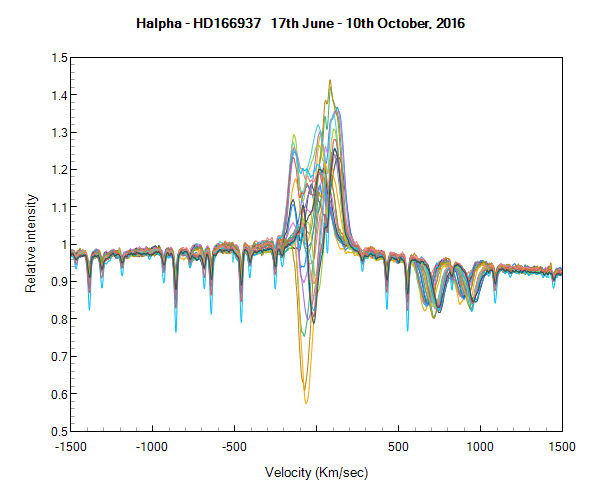 Additional information about the spectrum of this classical nova acquired as it entered the Fe curtain stage can be viewed on ATel #10795. 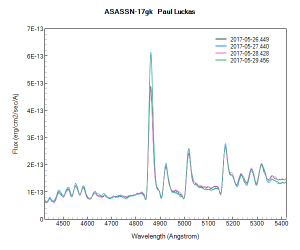 Nova ASASSN-17gk (ATel #10387) was confirmed at Shenton Park Observatory using the ALPY 600 at R~530. This very bright nova in Centaurus is near maximum and was easily identified with a 600s exposure. Further detail kindly provided by Prof. Steve Shore can be found in the confirmation ATel (ATel #10399) and subsequent correction (ATel #10400). 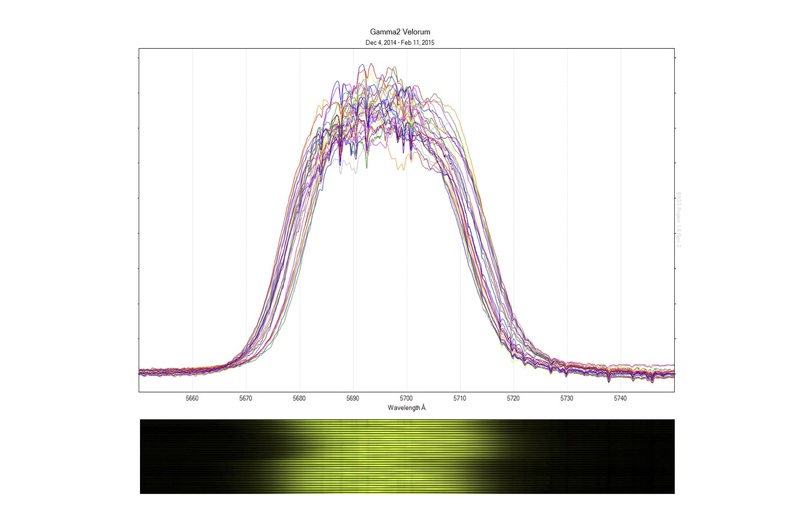 Two documents created to provide a brief summary of response correction and in particular using the response assistant in ISIS for spectra acquired with the Alpy 600. 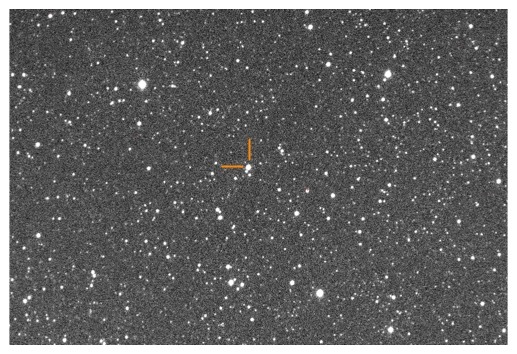 A second nova this week, confirmed in a spectrum taken with the target setting in the western sky on October 27. The ATel (also kindly prepared by Steve Shore) can be found here: (ATel #9678). A follow up ATel hinting to the nova’s progenitor can be found here. 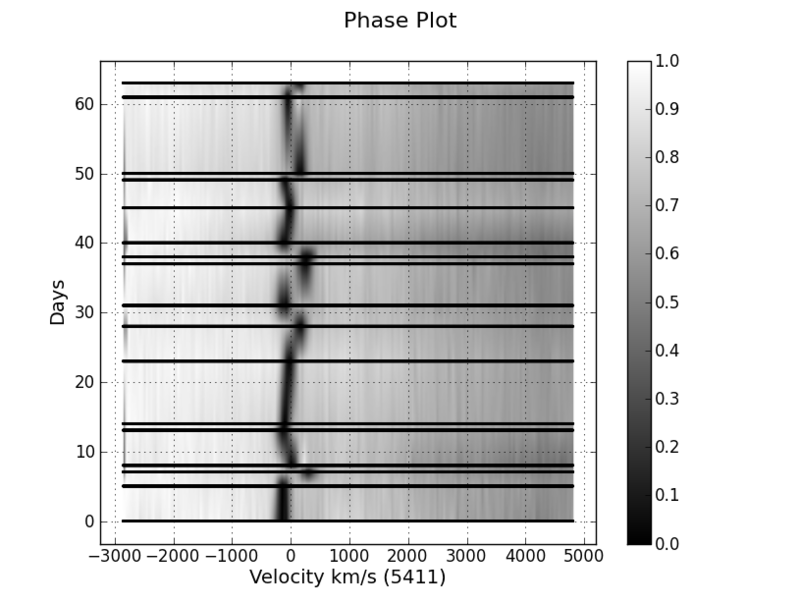 A confirmation spectrum of TCP J18102829-2729590, a galactic nova in Sagittarius. 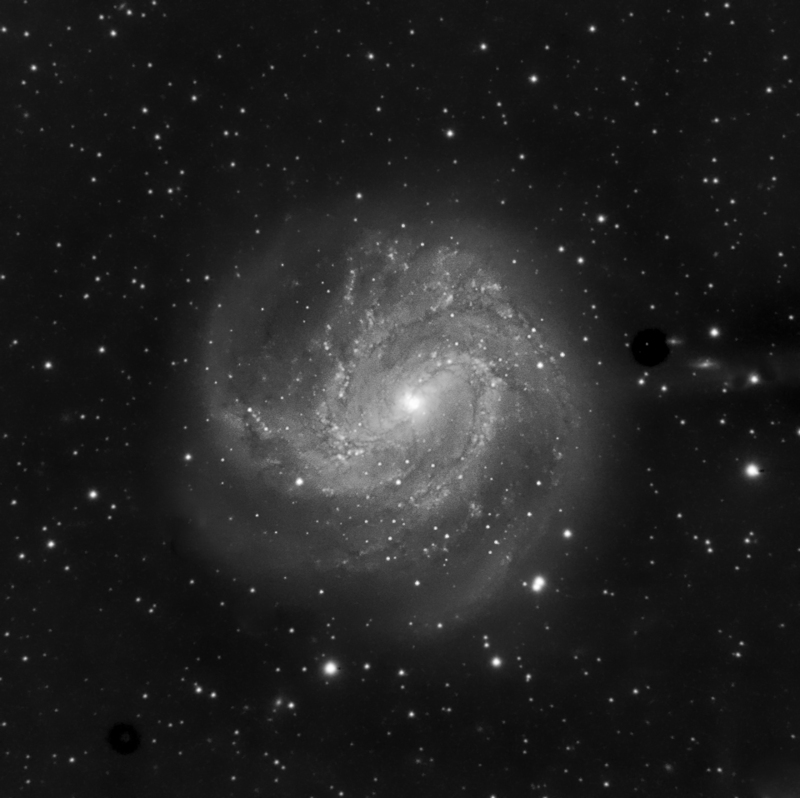 The target, setting rapidly in the west, was imaged using the Alpy 600 under challenging conditions, providing confirmation as a classical nova in the optically thick stage. The resulting ATel (kindly prepared by Steve Shore, University of Pisa) can be found here. 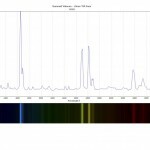 Additional spectra at both high and low resolution have been acquired and made available via the ARAS spectral database. 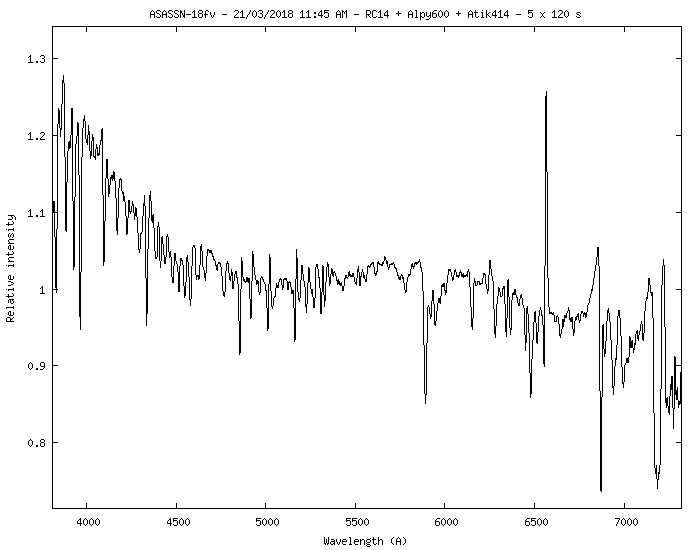 22 spectra of mu Sgr showing clear evidence of the orbital characteristics of this enigmatic binary, now 115 days through its 180 day period. 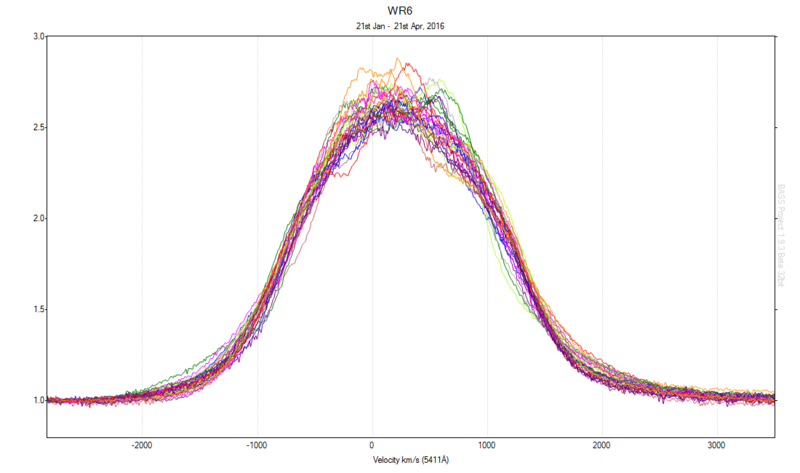 The variability could show evidence of atmospheric eclipsing, together with wind variability. As the target sinks towards the dusk sky, it’s unlikely that many more spectra will be available this season. 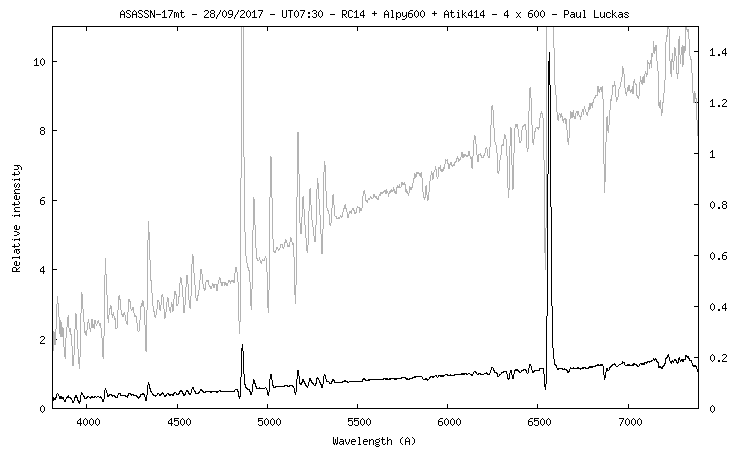 The 2016 WR6 campaign wrapped up on 21st April with 20 spectra acquired over 91 days at the target wavelength of 5411Å. 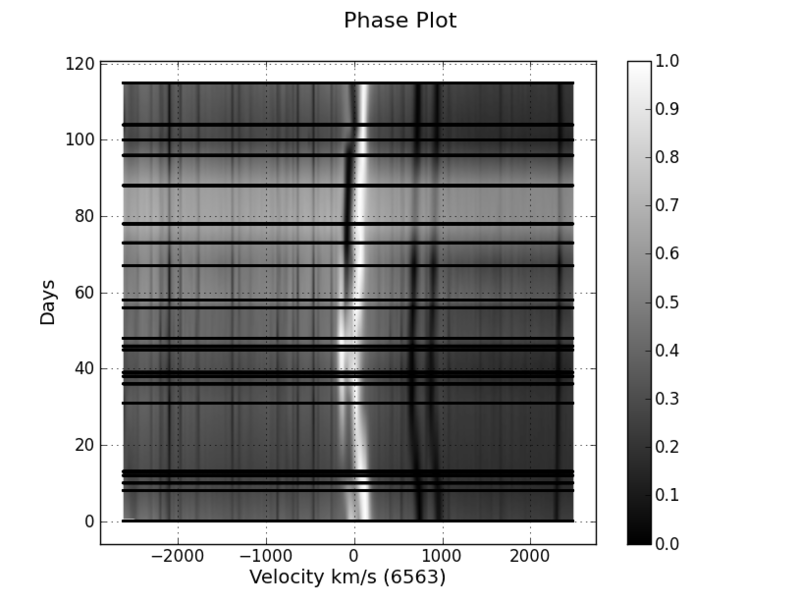 Datasets of the rare blue supergiant UW Canis Majoris – a eclipsing contact binary. 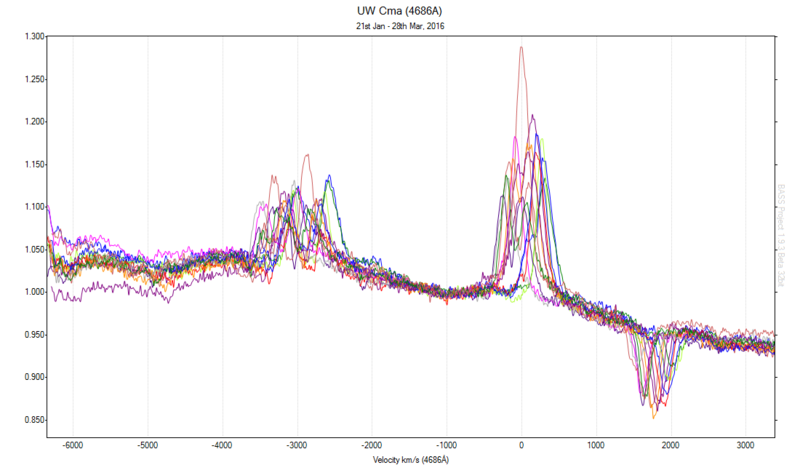 Lhires III spectra acquired at two target wavelengths, He II at 4686Å and 5411Å, over a 2 month time frame to coordinate with BRITE-Constellation satellite photometric observations. The following spectral image was taken during the day on January 25th, 2016. 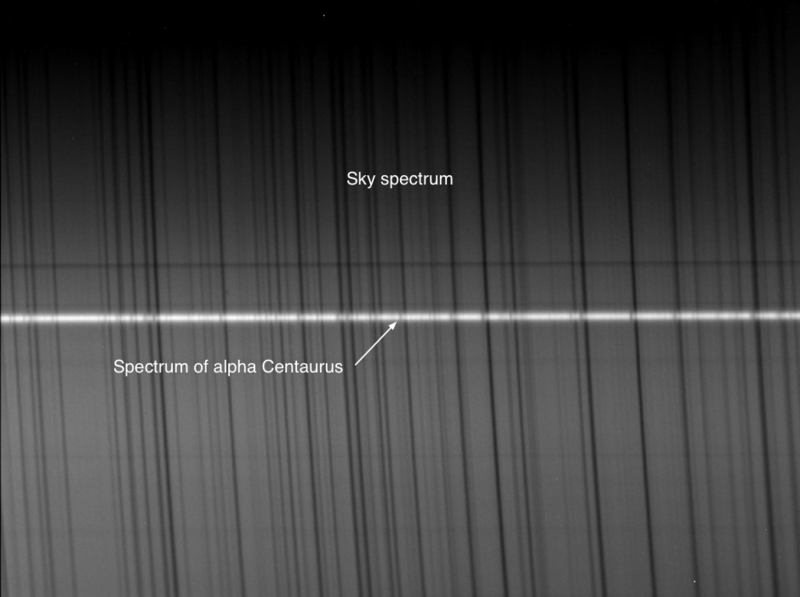 It shows a spectrum of Alpha Centaurus superimposed on the background solar (sky) spectrum. This high resolution Lhires III spectral image spans about 130Å in the ‘green’ part of the EMS. 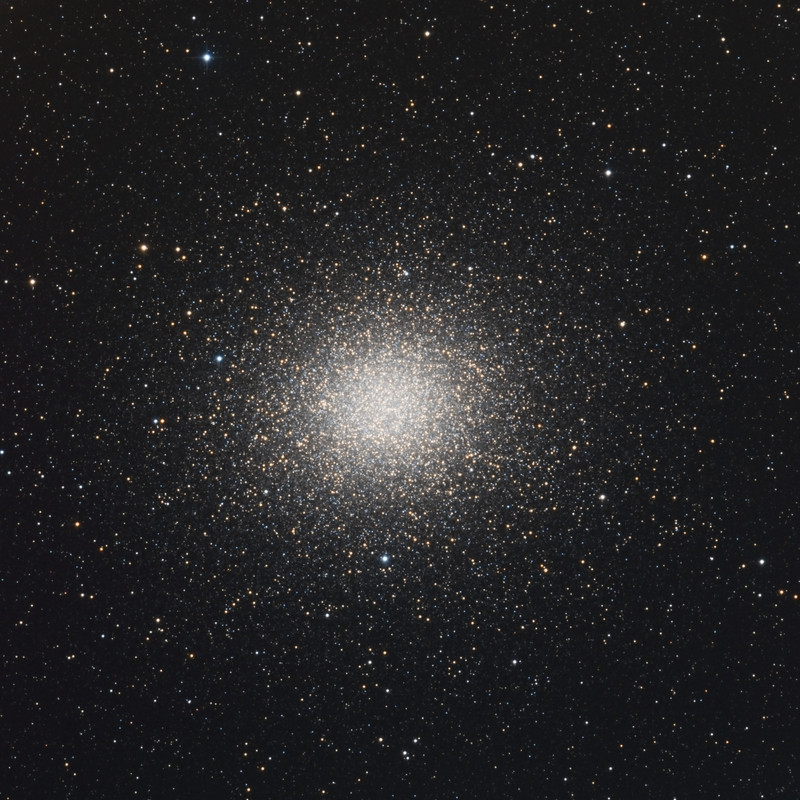 As a type G2V star, Alpha Centaurus exhibits the same absorption features as the sun. 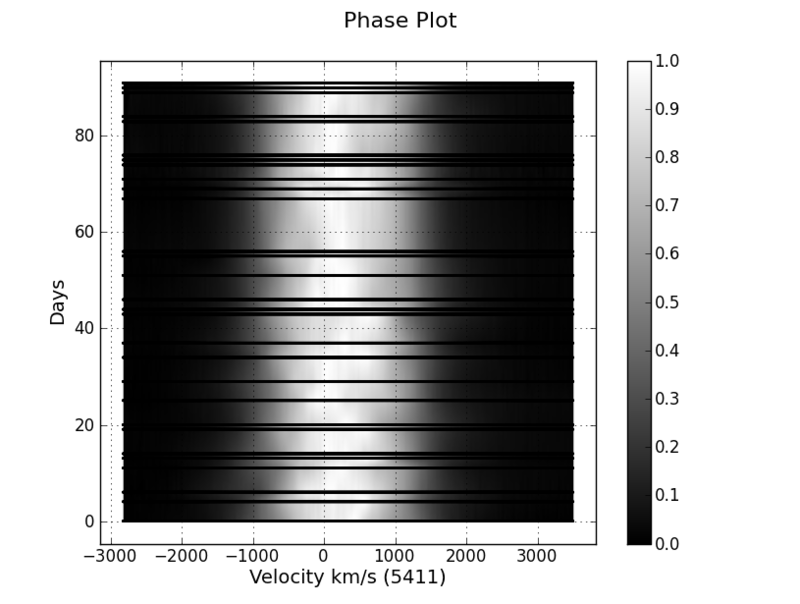 The following is a small sample of Be stars acquired as part of the BeSS initiative showing excellent alignment with atmospheric telluric lines, despite using only a 3 line, second order polynomial dispersion calculation for spectral calibration. 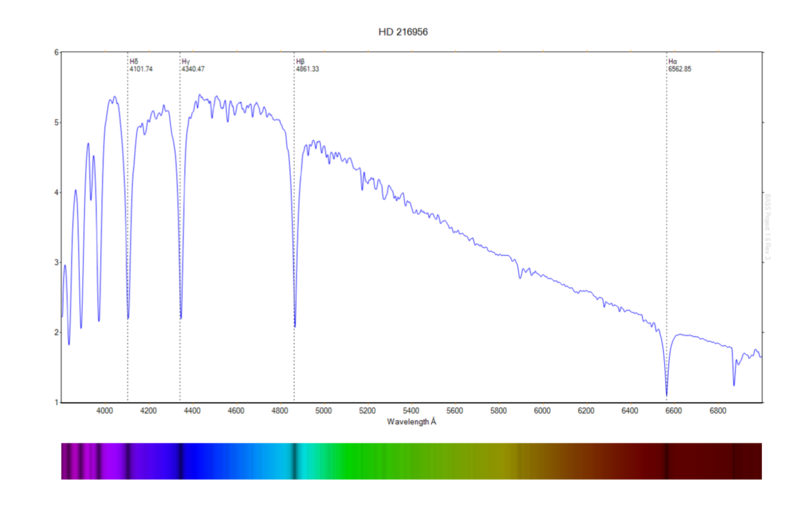 A test of the Shelyak Alpy 600 using a Takahashi FSQ-85 shows extremely well corrected spectra, particularly notable at shorter wavelengths which are typically problematic for refractors of simpler design. 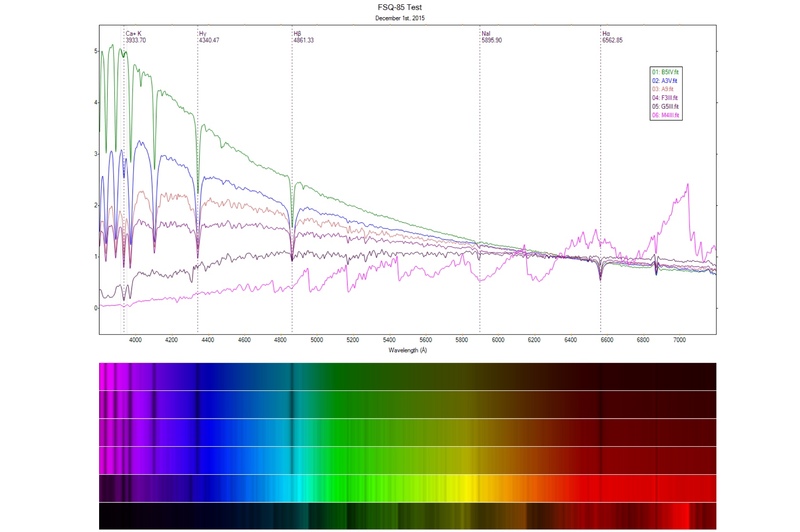 Several spectra of the star Fomalhaut acquired simultaneously with Lhires III and Alpy 600 spectroscopes illustrate the difference between high resolution and low resolution spectroscopy. 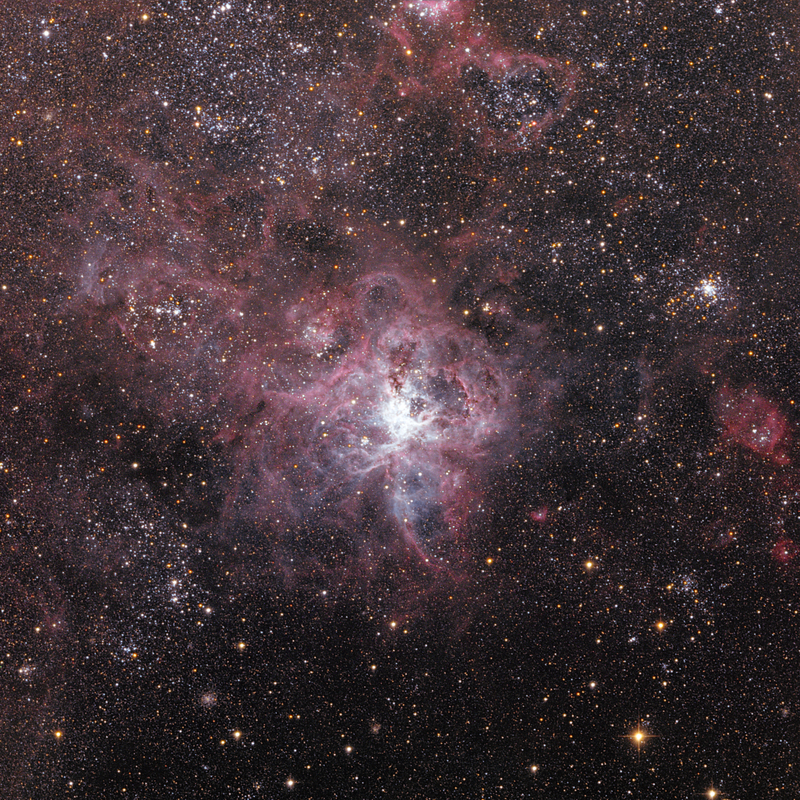 A series of A-Type stars acquired on the 17th and 20th September, 2015 with an Alpy 600. Even at low resolution, it’s possible to detect subtle increases in complexity in the sequence. 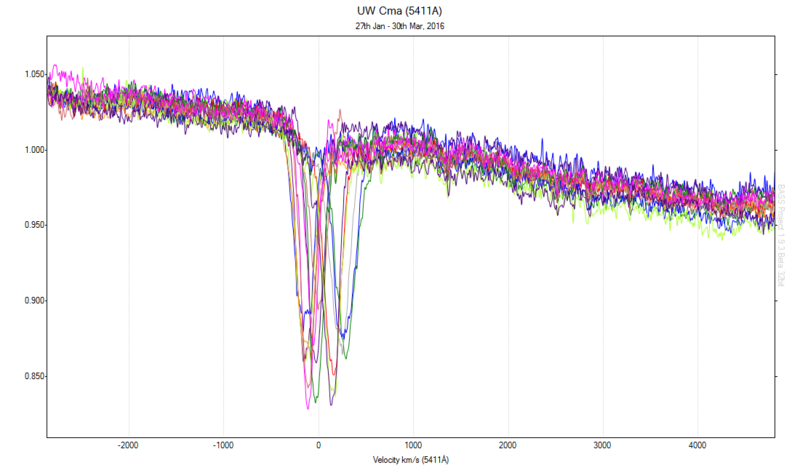 An increase in line strength of ionised CaII is particularly obvious. 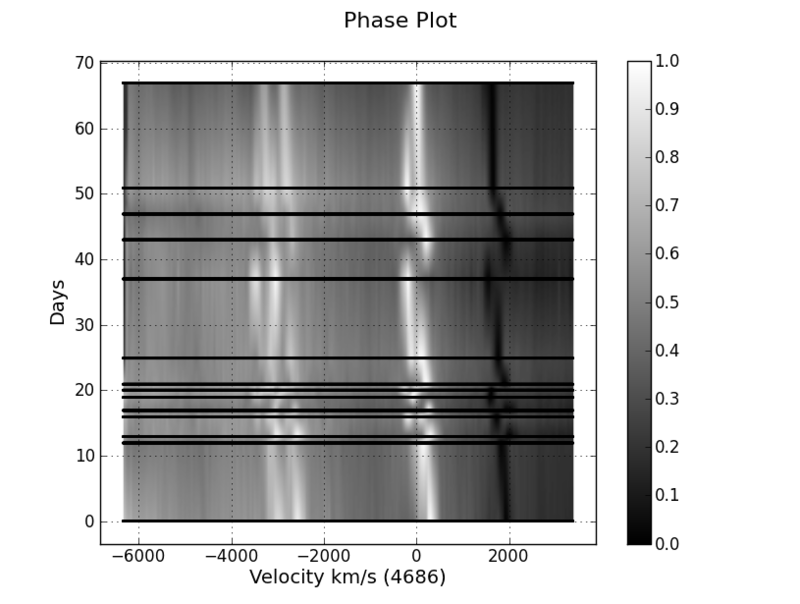 A test of the new Shelyak Alpy 600 low resolution spectrograph showing a sequence of OBAFGKM stars. 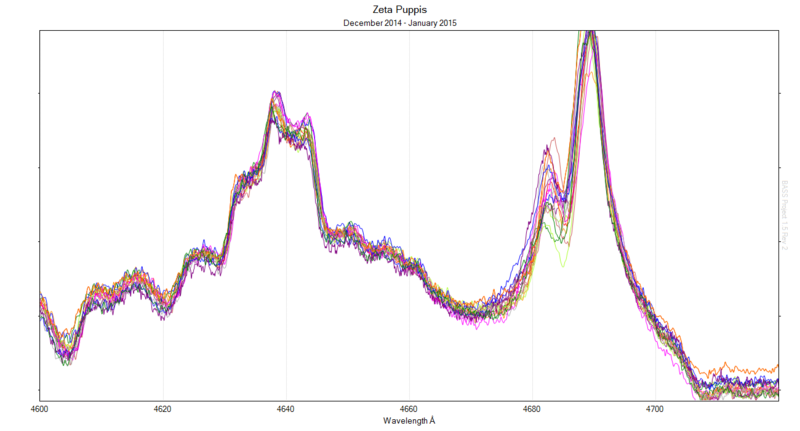 A number of plots illustrating the dynamic nature of zeta Puppis from data acquired on the 12th March 2015. 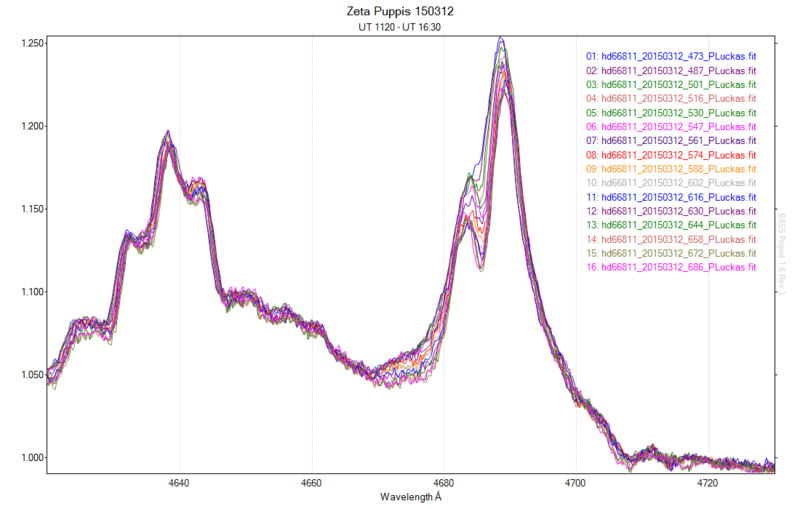 20 spectra of zet Pup taken between UT 1130 and UT 1830 on February 19, 2015. The gam² Vel campaign entering its third month (click to enlarge image). The impressive feature at 5696Å is the C III emission of the Wolf-Rayet companion, and the ‘left-right’ wavelength shift over time is a result of its 78.5 day orbit. The clumps on top are caused by interacting regions of the massive and thick stellar winds of the two stars – the subject of research for this particular campaign. 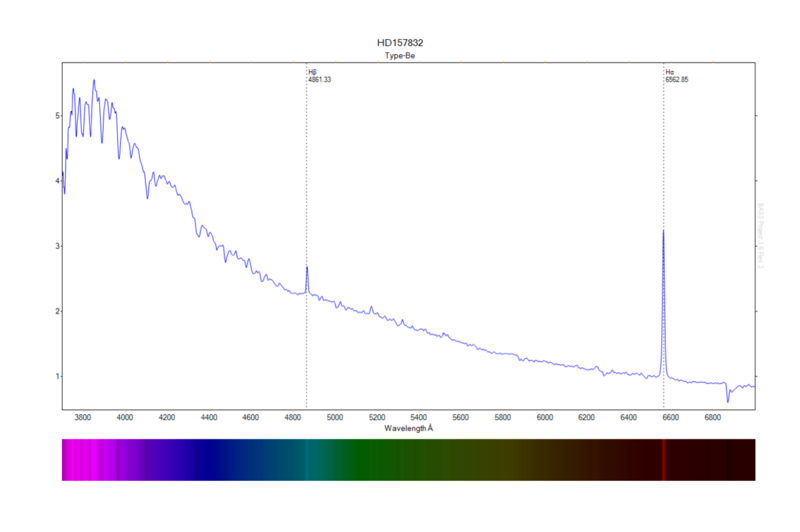 Some test absorption and emission spectra acquired with the Lhires III using a 150 l/mm grating. 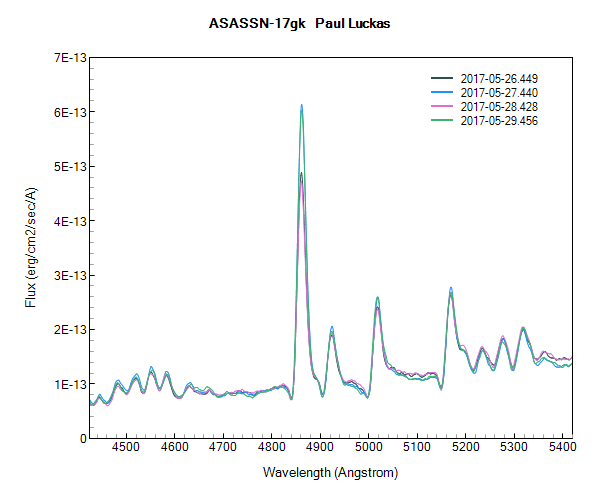 An animation of 20 spectra taken between Dec. 11 2014 and January 28 2015 showing a continually varying HeII feature (click to enlarge). A quick representation showing 1.5 month’s worth of data collected so far for the 2015 zet Pup and gam² Vel spectroscopic monitoring campaigns. 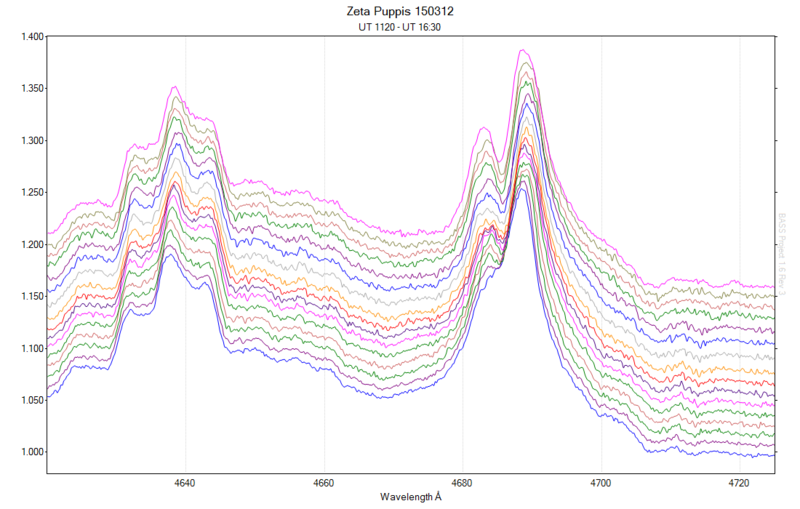 Zet Pup spectra target the 4686Å HeII emission feature, while the CIII feature at 5696Å is the target for gam² Vel. 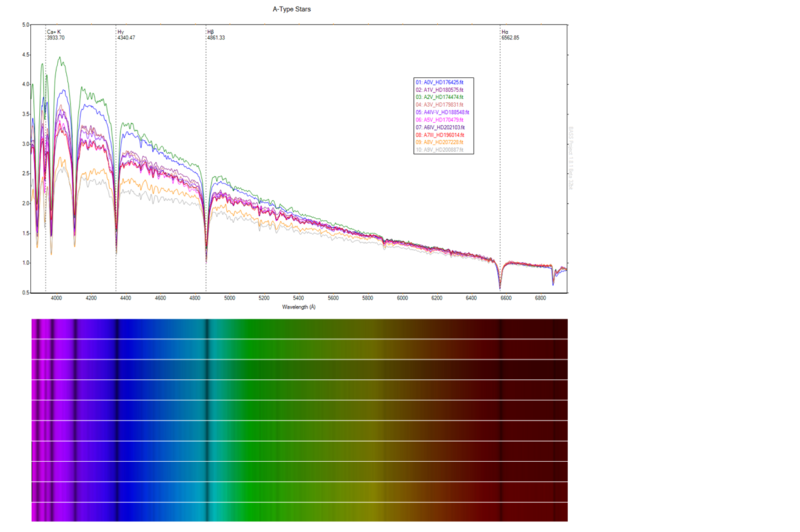 Using a Lhires III spectroscope with 2400 l/mm grating and a 35µm slit yields R~ 9000 and S/N > 500 with 12.9µm pixels of the Atik 314L+ CCD camera on a typical 10 – 15 minute integration. 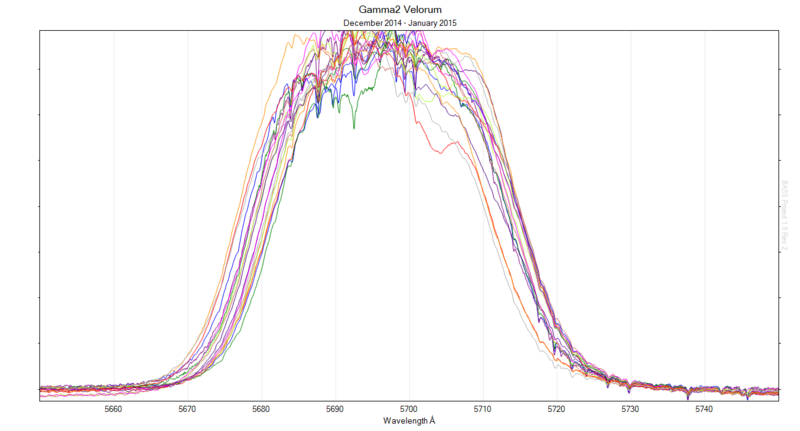 The 29 spectra submitted to the 2014 international eta Carinae campaign feature as part of ATel #6380 (August 11) and ATel #6464 (September 12). 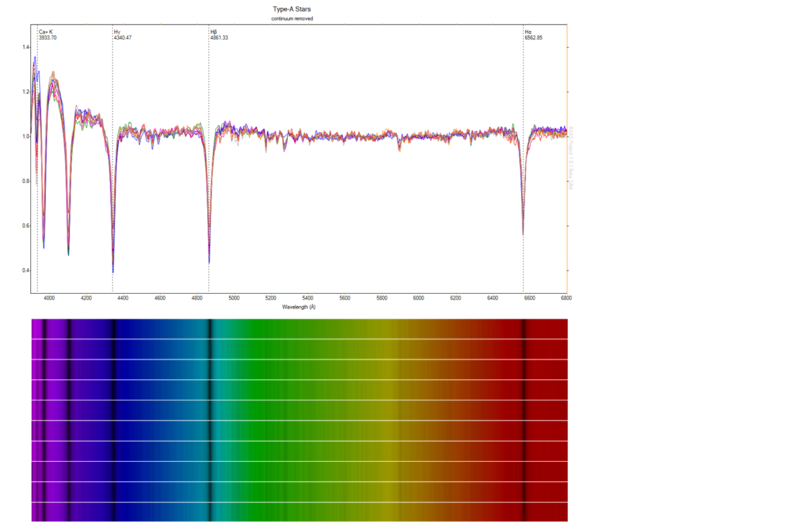 A test data acquisition of Eta Carinae spectra to assess the potential for contributing to current monitoring projects. Conditions were poor (cloudy) but results look promising. 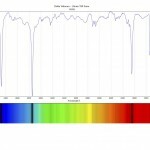 The profile below has been corrected for instrument response and normalised. 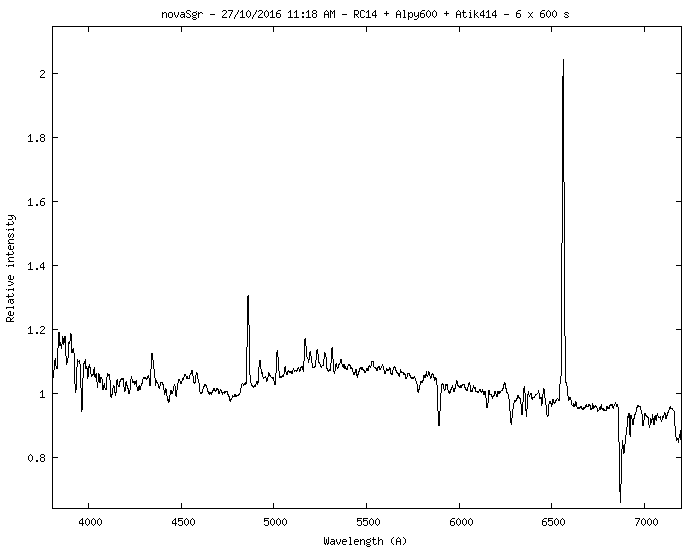 Spectroscopic observations of the magnitude 5.66 Wolf-Rayet star Theta Muscae reduced using BASS. 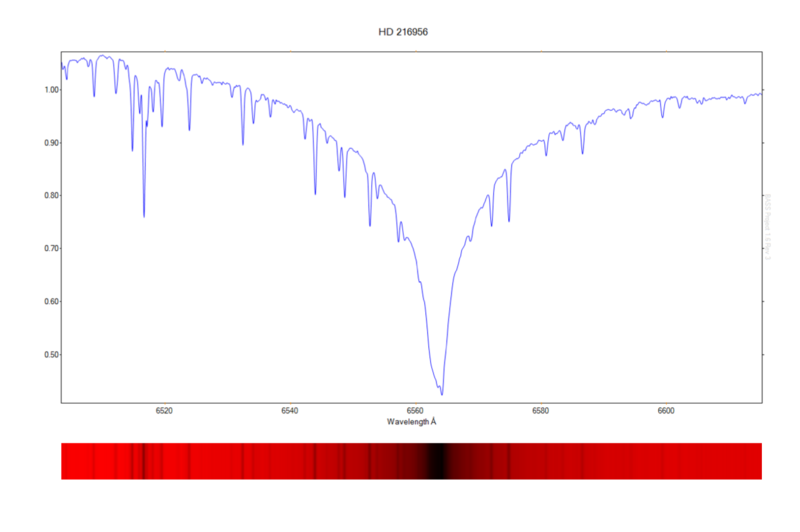 ‘First light’ star testing of a Spectra L200 spectroscope . Click “Continue reading” below to see the entire analysis. 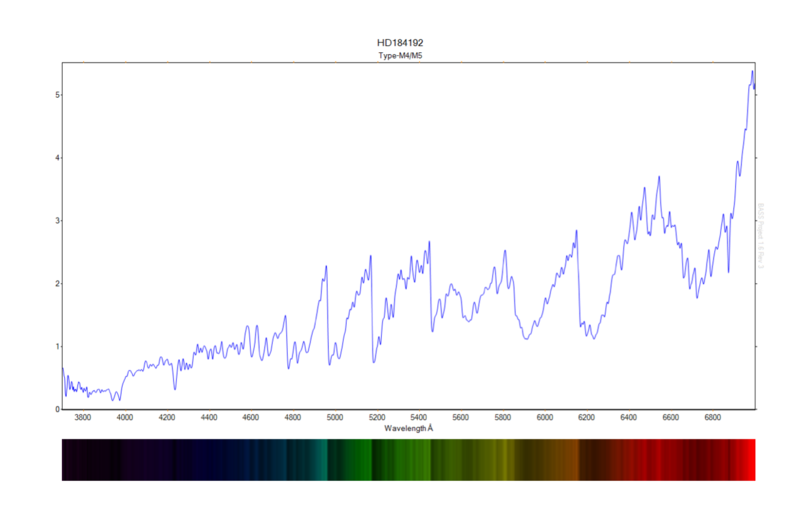 Further calibration and testing of a Spectra L200 spectroscope on the solar spectrum (pointing the telescope at the day time sky) using the integrated neon lamp for calibration. Click “Continue reading” below to see the entire analysis. 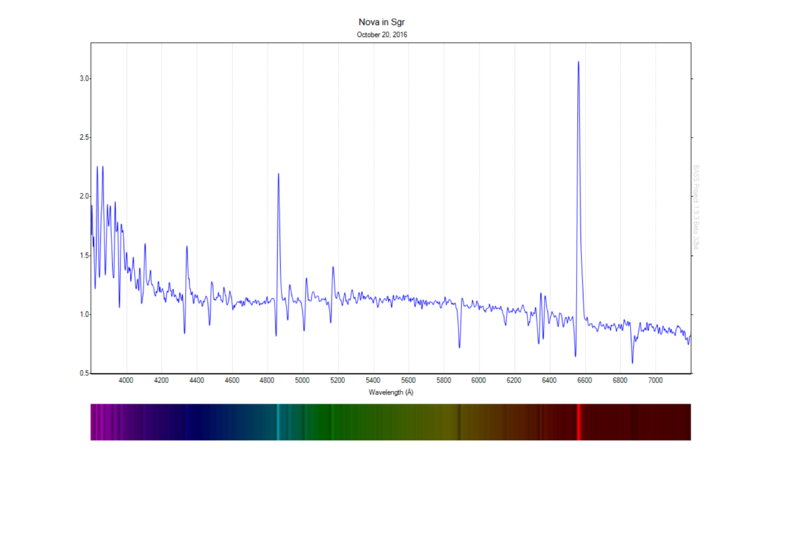 Initial calibration and testing of a Spectra L200 spectroscope using the integrated neon calibration lamp. The analysis was undertaken using “BASS”. Click “Continue reading” below to see the entire analysis. Two quick time lapse sequences of the southern sky taken on a recent camping trip to the West Australian gold fields. 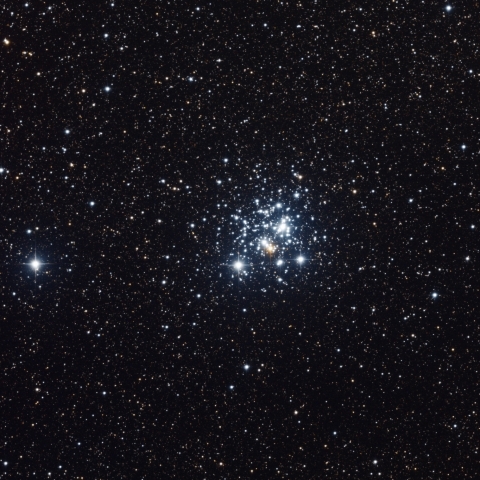 Two clusters, one region of the sky. 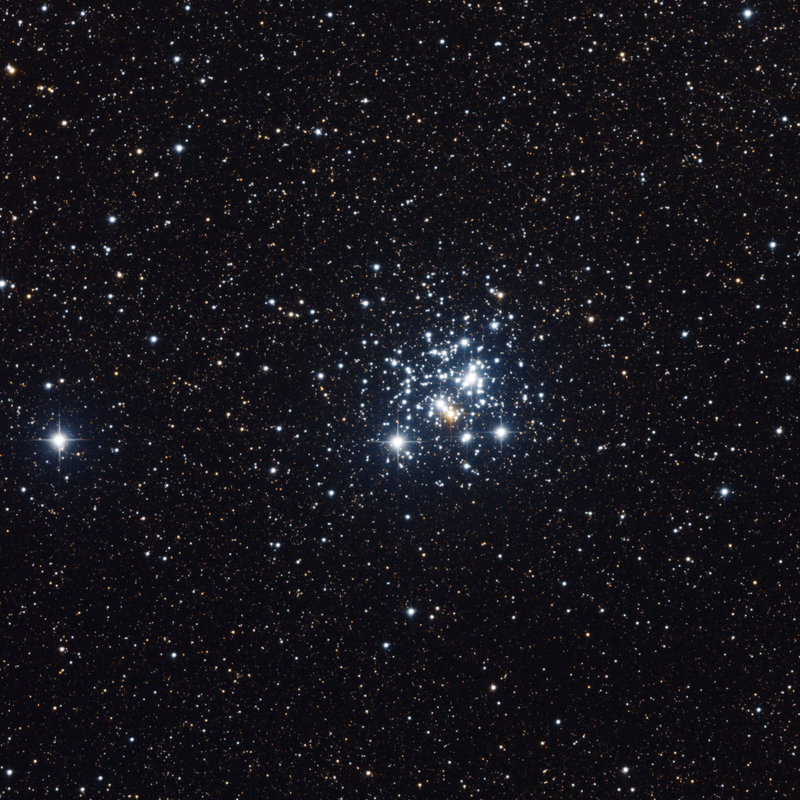 The Jewel Box is, arguably, one of the best examples of an open cluster. 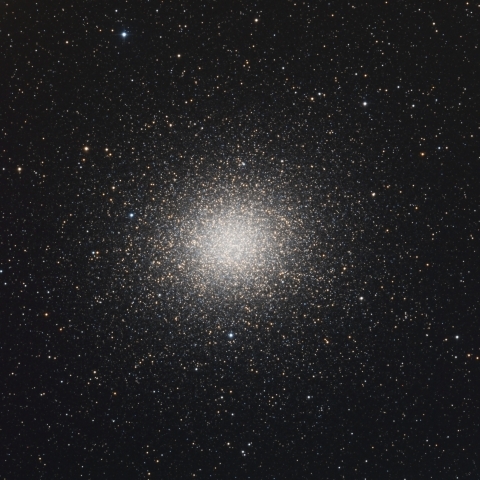 The great Omega Centauri globular cluster is the best example of its kind. An LRGB image of NGC 2070, the Tarantula Nebula, taken under poor seeing conditions.